Wunderblock is an exhibition of new work at the Freud Museum in London, 6 March- 26 May, 2019, by artist Emma Smith, drawing on original historical research into the post-war fascination with the infant mind. This research, undertaken by the Hidden Persuaders Project, examines the ways in which the ‘psy’ sciences tackled problems of influence, coercion and autonomy in the life of the child after World War Two. In turn, we are interested in how these disciplines have shaped, and continue to affect, our visions of the child’s inner world. One of the project’s doctoral students, Katie Joice, is researching the visual methodologies that child psychoanalysts and psychiatrists used to translate formative — or deformative — infant experience into diagnostic concepts and curative practices. These practitioners adopted the roles of film directors, toy-makers, sculptors and art critics in order to access the ‘black box’ of pre-verbal consciousness. Although the models of mind that emerged from these practices were often contentious, this generation of thinkers was united by the strong causal relationship they drew between infant experience and future vulnerability to mental illness. They also learnt that understanding the infant or child patient was as much about looking carefully, as it was about listening. 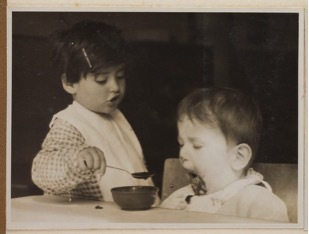 One of the important developments, in this period was the practice of ‘baby observation’ that came to be built into many clinical trainings here and abroad. These preoccupations with early development and patterns of relating were amplified by recent experiences of war and totalitarianism. A generation of children had experienced conflict, separation from their families, or life in institutions. After 1945 there was considerable anxiety about how children’s minds might be adjusted to support fascism, communism or liberal democracy. From this emerged a new concern with all types of environmental influences upon the child. The mother’s relationship with her newborn became a central focus, as did the triangle of mother, father and baby. Whilst the pressures of war and the Nursery School Movement had encouraged women of all classes to work, post-war research into the needs of children, most influentially that of psychoanalyst John Bowlby, explored the life-long consequences of the earliest patterns and difficulties of ‘attachment’. Such ideas were taken up in diverse ways, but could be used to put women under pressure to return to and stay in the home, just as soldiers were returning from war. Arguably, the political interest in children’s care inside and outside the home was concerned as much with regulating the population, as it was with supporting the child and recognising their rights. Nurturing infant mental health, monitoring child-rearing and supporting ‘good’ parenting became inextricably linked to the interests of the state and its aspirations for generating democratic citizens. Smith’s exhibition turns some of this complex history about benign and malign influence over the child on its head, to ask ‘What is the agency of the child?, ‘What is innate to the infant and in what ways are they an ‘expert’?’, and, crucially: ‘To what extent does the baby or child, in fact, influence the adult and the adult world?’. Inspired by the rich history of infant observation undertaken by figures such as Melanie Klein, Anna Freud, Margaret Lowenfeld and Donald Winnicott, as well as the emergence of child-centred pedagogy and the anti-psychiatry movement, Wunderblock considers how we might engage with this history and ultimately meet the child from their own perspective. As one of the leading social practice artists in the UK, Smith places engagement at the heart of her approach. As well as having worked with the Hidden Persuaders research team for the last year, Smith is engaging with children, parents, teenagers, and professionals in the fields of child mental health, childcare and education, as she develops Wunderblock and its accompanying public events programme. By gathering the input of a wide range of people, each an expert in their own right, Wunderblock recognises the historical significance of the Hidden Persuaders’ research and firmly relates this to contemporary narratives and preoccupations. These include growing concerns surrounding the mental health of children and young people, and their rights and agency in society. The exhibition’s title, Wunderblock, is taken from the title of Freud’s essay ‘The Magic Writing Pad’, where it refers to the layers of the self that are constantly re-written but may later re-emerge from beneath the surface. In the exhibition, these layers are peeled back to reveal the child as a complex person rather than merely a malleable future citizen or sponge for the influence of others. Wunderblock will unfold across the Freud Museum through a number of interventions. Using sound, interactive installations, and the Museum’s own collection, it will respond directly to the significance of this unique domestic setting. The exhibition and events will aim to provoke debate and reflection on contemporary attitudes to the shaping of the infant mind, and to encourage audiences to question and consider their own beliefs in relation to the current status of children in our society. Wunderblock is curated by Rachel Fleming-Mulford, and is commissioned by Birkbeck College, University of London for the Hidden Persuaders Project, funded by the Wellcome Trust Public Engagement Fund. The exhibition will be accompanied by an exciting public programme, which will include events tailored to families, teenagers and broad adult audiences. Emma Smith is a visual artist based in the UK, who works internationally. She has a social practice and creates public platforms for experimentation, research and action through site-specific events and installations. Smith’s work tests the boundaries of human connectivity: relationship, communication, sense of place and entanglement. Her work looks in particular at hidden forms of connection: the intimate, the transient, the subconscious and the invisible. Previous exhibitions and commissions include Tate Modern, Barbican, Whitechapel Gallery, Bluecoat, Whitworth, ICA and Arnolfini, UK, with international projects across the globe.